Some flights go directly to Tromsø, but many require a change (often at Oslo). We flew direct from London Gatwick to Tromsø with Norwegian - this was a more expensive way of doing it but worth it for time and hassle saved. There are several car hire companies operating from Tromsø Airport. Like everything in Norway, it isn't very cheap. This site allows you to check whether particular roads are closed. This webpage gives links to webcams on roads across Norway. For the Lyngen area, we stayed at Strandbu in Skibotn (N 69deg22.6277, E 20deg16.1243). They have a variety of cabins accommodating up to six people. The owner is extremely helpful. They also have a wood-fired sauna on site. We absolutely recommend this place! Skibotn seemed an ideal place to be based. It is fairly central to the Lyngen climbing areas, with none more than an hour away (with good driving conditions). Aadne Olsrud, one of the friendly locals we sought advice from, has opened some apartments in Tamok that are targeted at climbers and skiers. His Facebook page is worth checking out as another option for somewhere to stay. Search for Olsrud Adventure on FB. Every town / village seems to have a Co-op or Joker mini-market type store. There are larger supermarkets in Tromsø (worth going to on way from airport if time allows) and Nordkjosbotn and over the border in Finland. Always make time for cake. Too early in the year and there is very little daylight. We had sufficient daylight when we went at the end of February, probably nearing on 12hrs of daylight. During our visits, temperatures have ranged from +5 to -12degC, but can be much lower. Check these weather statistics. Norway has a fantastic weather service that, in our experience, was very geographically specific and quite accurate. Check the difference between Skibotn, Lyngseidet and Furuflaten - these are all only a few kms apart. None of them are really that far in distance or height gain. The snow had a much bigger effect on our walk-in times, so we haven't given any estimates. Though something along the lines of "guess, double it and double it again" would have been accurate on some of our days! Our longest was three hours, not long by Scottish standards. One climb took two and a half hours of wading to get to and 25mins to get down - it was an icefall named 'Roadside'. If you are lucky with the snow, most will be quite short. Trenching through the snow basin. Snowshoes or skis are essential. We used snowshoes every day we were there. Most routes are descended via abolokov threads - take plenty of tat. Binoculars are very useful for spotting climbs and helping to guess how hard they could be! 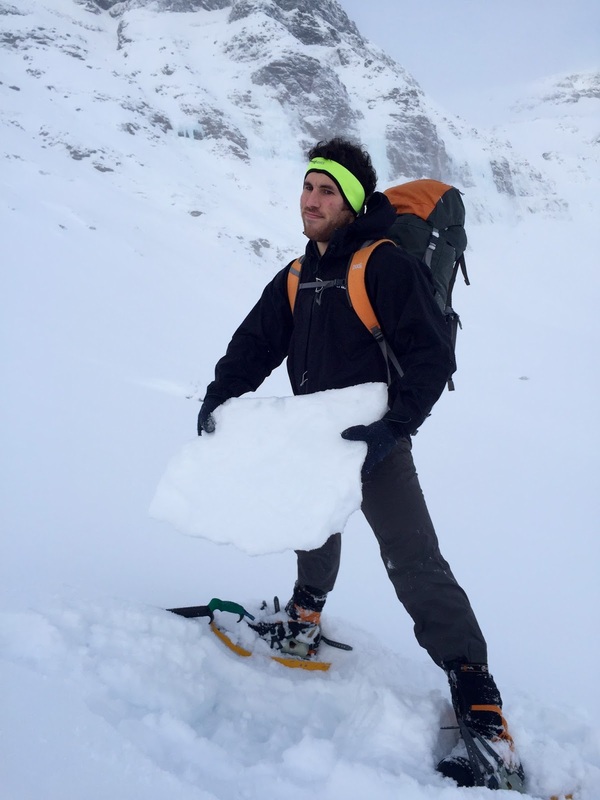 We did not have avalanche kit, but avalanches are a very real risk. Lyngen Lodge sometimes post up what they have been up to which may be useful. This truly brilliant website offers detailed mapping that can be saved and printed. It is worth printing copies for all the areas listed on this guideblog. We did not need to 'navigate' at all during our trip. Ice climbing is dangerous, disclaimer done. Emergency numbers are 112 and 113. But have a read of this anyway: http://gravsports.blogspot.com/2011/03/ice-climbing-is-not-rock-climbing.html. We were told there is a mountain rescue service, including helicopter rescue similar to the UK - don't take our word for it though. There are many opportunities for roadside cragging. We tend to do this at the start of a trip to reacquaint ourselves with the ice and to get a feel for ice conditions (low-level at least). One of the best places we've found is on the E6 north of Skibotn. There are a few bits and pieces on the web about ice climbing in the area. Some links we found useful are below, but we can't vouch for accuracy. The petrol stations sell hotdogs. Jim swears by them. Nick swears at them. Norwegian hotdogs are the food of gods. I think you mean dogs.